OK, let’s see: President Neophyte treated Brown and the British press like snot, and is now making excuses that expose his true executive nature. Perhaps President Neophyte could have called up Brown and cancelled the visit? But, I do like how he and his administration are “bemused” about complaints regarding the shoddy treatment, which includes, if you remember, Brown and his wife giving fantastic gifts to the Obama’s, and, in return, the Browns received presents equivalent to a fruit cake. What is Michelle Obama’s excuse for being a poor host? Perhaps it is all the partying the Obama’s have been doing on the public dime quarter silver dollar (we have to account for the massive inflation Obama’s spending will cause.) They sure do not seem to be too tired for that. He sure didn’t seem too tired for a visit by Brad Pitt. 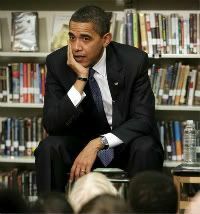 He didn’t seem too tired when he rushed to Columbus, Ohio, to take credit for creating 25 jobs (as 651,000 were lost.) He doesn’t seem too tired as he decides to have a dialogue with the Taliban. Though, he does seem a little tired when it comes to earmarks, which he says he will fight next year. What’s the expiration date on that promise? The real views of many in Obama administration were laid bare by a State Department official involved in planning the Brown visit, who reacted with fury when questioned by The Sunday Telegraph about why the event was so low-key. The official dismissed any notion of the special relationship, saying: “There’s nothing special about Britain. You’re just the same as the other 190 countries in the world. You shouldn’t expect special treatment.” The apparent lack of attention to detail by the Obama administration is indicative of what many believe to be Mr Obama’s determination to do too much too quickly. Read that again. “Nothing special about Britain.” Apparently, this is how Obama intends to heal the world and the US reputation. By destroying our links to long time allies. On the bright side, he’ll create new ones with nations like Iran and Syria. Ed Morrissey: I’m not sure which is worse. At least if he meant to snub Brown, it would suggest a certain competence at this brand of diplomacy. Instead, we’re told that the Obama White House and their staff are just a bunch of incompetents who got in over their heads. Sister Toldjah: Gosh, the job of a President sure is hard work. Who’da thought?! Six Meat Buffet: I guess this is a little tougher than his old “job” of Community Agitator. Amateur houris far too kind a description, Cramer. Wizbang: I guess I would be tired too if my goal was to demolish a 233 year old capitalistic democracy into a fully functioning socialist regime in a 5 week period. PS: Just to invalidate the whole excuse from Team Neophyte about him being tired: (Obama) struck a reassuring tone about the economy, saying he had no trouble sleeping at night.